The FN SCAR (Fabrique Nationale Special Operations Forces Combat Assault Rifle) is a gas-operated (short-stroke gas piston) self-loading rifle with a rotating bolt. It is constructed to be extremely modular, including barrel change to switch between calibers. The rifle was developed by Belgian manufacturer FN Herstal (FNH) for the United States Special Operations Command (SOCOM) to satisfy the requirements of the SCAR competition. This family of rifles consist of two main types. 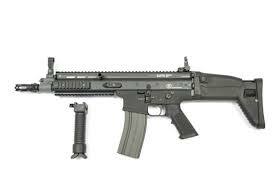 The SCAR-L, for "light", is chambered in 5.56×45mm NATO cartridge and the SCAR-H, for "heavy", is chambered in 7.62×51mm NATO. Both are available in Close Quarters Combat (CQC), Standard (STD) and Long Barrel (LB) variants.